These places – from among the ones we’ve visited so far - easily rank as our favorites. For local (Philippine) destinations we chose those places that gave us a greater sense of adventure, possessed excellent natural beauty and were relatively inexpensive to go to – a must-visit list for Shoestring Travelers. Caramoan, Camarines Sur. Rapidly becoming popular after the location shooting of Koh Lanta, the French version of Survivor in 2008, the Caramoan Peninsula combines the fascinating limestone cliffs of El Nido and Coron with the white sandy beaches of such places like Boracay. Travel to this place is not yet as convenient as to other prime tourist spots but consider that part of the adventure. Coron, Palawan. A surreal world with its massive limestone karst formations, serene lagoons, mysterious inland lakes and vibrant underwater marine life, Coron never ceases to amaze. Numerous islands make up the Calamian Island group and are accessible from Coron, giving a host of alternatives for the traveler. The views of the underwater world around the sunken Japanese ships off Coron are listed in Forbes Traveler Magazine’s top 10 best diving sites in the world. 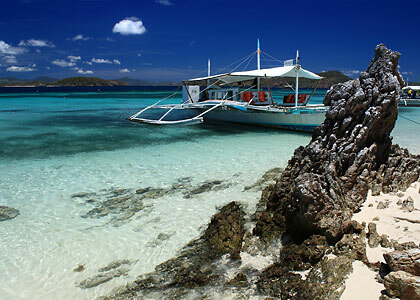 The white sand and crystal clear waters of Bulog Dos in Coron. Ilocos Coast. A journey we’ve done repeatedly and have always enjoyed, the Ilocos Road Trip takes you through a collage of well-preserved Spanish-era churches and poblacions, sleepy little towns, stunning coves and a ruggedly beautiful coastline. Batad Rice Terraces, Ifugao. It may not be as famous as the rice terraces in Banaue town proper but Batad's rice terraces are certainly more dramatic in appearance. It also takes a little adventure to get there. Vietnam. As a tourist destination, Vietnam has a little of everything: religious and historical sites, cool highlands, pristine beaches, local markets, excellent cuisine and its people. Their ice coffee and pho or noodle soup are our favorites and we're ravenous fans of their Banh Mi or baguette sandwich. San Diego, CA. We have to admit we’re a little biased towards “America’s finest city,” having been residents of San Diego and having many friends there. But who wouldn’t be with its Mediterranean climate, sunny beaches and that southern California lifestyle? Big Sur. Our road trip along Highway 1 starting at Carmel all the way down to Orange County took us to some of the most memorable vistas we’ve ever seen in America. 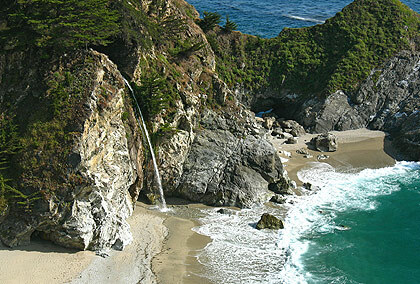 The most stunnung views may be found on a 90-mile stretch of the highway just beyond Carmel known as Big Sur. These breathtaking views were a primary reason why Big Sur ranked second among all United States destinations in TripAdvisor’s 2008 Travelers' Choice Destination Awards. Yosemite National Park. The Grand Canyon might be awe-inspiring and certainly one of the world’s wonders of nature but Yosemite stood out for us because of its sheer beauty. Its waterfalls, deep valleys, granite peaks, giant sequoias, vast wilderness and Mediterranean climate make it an ideal adventure destination for travelers.